Excited? It's the event you have all been waiting for! 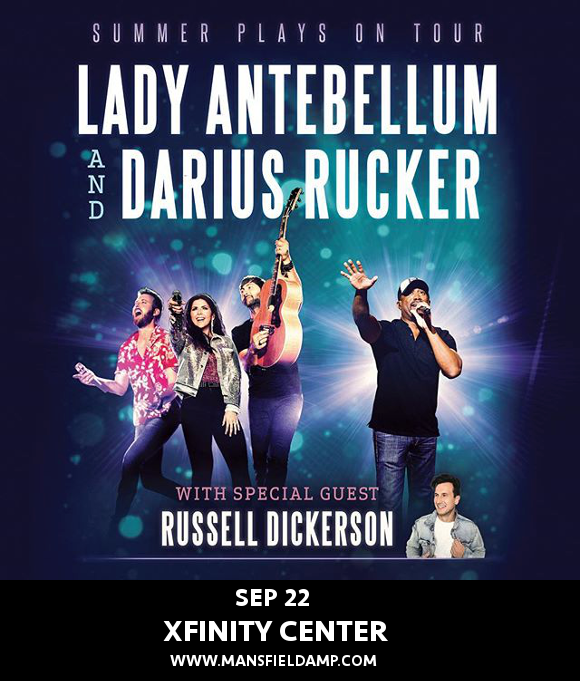 Lady Antebellum are on tour with their latest album “Heart Break,” and they’re joined by the wonderful Darius Rucker, with opening act Russell Dickerson!! Country fans can’t afford to miss this show at the Xfinity Center on Saturday 22nd September 2018! Be sure you get your tickets today. Instant downloadable E-tickets are available for last minute purchases, so there’s no excuse not to go!! Formed in 2006 by Hillary Scott, Charles Kelley, and Dave Haywood, Lady Antebellum made their debut in 2007 as backing vocalists on "Never Alone” by Jim Brickman. Since then, after being signed to Nashville, the trio have made leaps and bounds forwards in popularity, with six albums on the label – “Lady Antebellum,” “Need You Now,” “Own the Night,” “Golden,” “747,” and “Heart Break,” in addition to their Christmas favorite “On This Winter's Night”. The band have been nominated and won multiple Grammys in addition to other awards. Lady Antebellum’s latest album, “Heart Break,” described by Vulture as a “huge pop album disguised as a country record,” hit number 4 on the Billboard 200, with several singles, including “You Look Good,” and “Heart Break.” With funk elements and infectious earworms infused into an album focused on the melancholy sides of love, Lady Antebellum look set to go down in history as one of the greatest country bands of all time. Don’t stay at home for this one. Grab those tickets now and make it a night to remember forever! !